Epic literature genre deals with some of the major epics written in different languages. Understanding English Literature often requires students to develop creative imagination, critical thinking and deeper understanding of historical and cultural specificities. Our Online English Tutors provide English Homework Help to help you sincerely with understanding the literature in genre based context. English Homework help allows you to understand the style, structure and properties of any literary work. The word ‘Epic’, stems from the Greek adjective ‘Epikos’ and from ‘Epos’ meaning ‘Word’, ‘Poem’ or ‘Story’. It is used for a narrative poem, lengthy in size, depicting a grave serious subject or reflecting stories of heroic achievements as well as the particular contemporary culture and social situation of a particular country, at some particular time in history. Apart from this, ‘Epyllion’ is another type of epic poetry which deals with the mythological or romantic theme. During nineteenth century another type of epic, ‘LittleEpic’ came into being, referring generally to the poems composed in hexameter, shorter in length and also to the poems composed during the English Renaissance. Mikhail Bakhtin in his essay ‘Epic and Novel’ refers to ‘Epic’ as a piece of literary work which deals with serious subjects like heroism, bravery, establishment of social justice through revenge. It generates a feeling of ‘national identity’, rooted to the soil where it belongs. ‘Epic’, unlike ‘Novel’ deals with the idea of ‘Absolute Past’ as it narrates the stories from distant past. Unlike ‘Novel’, ‘Epic’ tradition is an Oral tradition, usually being narrated in storytelling mode where there remains certain distance between the readers or the listeners and the characters of the epic. An ‘Epic’ generally begins by stating the main theme, this is called, ‘Praeposito’. In the beginning, the author generally invokes a Muse, to provide him with the divine inspiration. The narrative shows the heroes “in the middle of things” or “in medias res”, while using the flashback technique to refer back to the previous events. The use of ‘Enumeratio’ is evident to refer to the lengthy lists of objects, places. The use of ‘Epithet’ or stock phrases is also important feature. The examples which we are going to discuss are Homer’s ‘TheIliad’, ‘TheOdyssey’, Virgil’s ‘TheAeneid’, Dante’s ‘The Divine Comedy’ and Milton’s ‘Paradise Lost’. ‘The Iliad’ is an ancient Greek epic consisting of 15,693 lines, written by Homer during the eighth century in dactylic hexameter, in Homeric Greek language. The epic, set against the background of the Trojan War, narrates the events during the fight between Agamemnon, the king of Mycenae and Achilles, the great warrior. The epic is divided into 24 books. At the end of Trojan War, the war between Menelaus, Agamemnon on one side and Paris and Hector of Troy on the other side, regarding Helen, the wife of Menelaus whom Paris abducted earlier this story begins. The quarrel between Agamemnon and Achilles takes place as Agamemnon demands Achilles’s captive Briseis. In wrath Achilles persuades his mother Thetis to pursue Zeus to inflict losses upon Agamemnon and his army which led them to beg for Achilles’s help. The epic ends with the defeat and death of Hector in the hands of Achilles as he killed Patroclaus, Achilles’s companion, by mistake. ‘The Odyssey’ is an epic poem written by Homer during the end of the eighth century in Homeric Greek language and dactylic hexameter and it comprises of 12,110 lines. This is the second oldest existing work after ‘The Iliad’. This epic narrates the journey of Greek hero Odysseus who hasn’t returned to home in Ithaca to his wife Penelope and 20 years old son Telemachus, even after 10 years of the Trojan War. The Protector of Odysseus, goddess Athena urges Telemachus to search for his father after her discussion with Zeus. The epic ends with Odysseus’s return to Ithaca ten years after the ten years of the Trojan War and his slaying of the suitors of Penelope. ‘The Aeneid’ is a Latin epic written by Virgil between 29 and 19 BC. It consists of 8,986 lines, composed in dactylic hexameter and divided in 12 books. The first six books narrates the journey of Aeneas, from Troy to Italy, the rest narrates the victorious achievements of Aeneas. Virgil takes up the otherwise neglected character of Aeneas from ‘The Iliad’ and projects him under the spotlight to glorify the myth of National mythic hero and also the Julio-Claudian dynasty and Roman virtues. Written by Italian poet Dante Alighieri ‘The Divine Comedy’ is considered to be one of the major epic poems in the world. Divided in three parts and each part is further divided into 33 cantos, it is written in Tuscan dialect and deals with the poet’s journey towards the underworld which led him to his beloved Beatrice. A combination of the Thomistic philosophy, Aquinas’s Summa Theologicia, medieval values and Christian thoughts this can also be seen allegorically as the journey of Souls towards God. The first part ‘Inferno’ beginning from the night before Good Friday describes the poet’s journey towards underworld under the guidance of Roman poet Virgil where he meets many ‘sinners’ like Paulo and Francesca; the second part is ‘Purgatorio’ and in the last part ‘Paradiso’ Beatrice guides him to the God in the Emperior region or the region of truth. ‘Paradise Lost’ is an epic poem divided into 12 books written by 17th century English poet John Milton which describes the story of the ‘Fall of Man’, ‘The Expulsion of Adam and Eve’, ‘The Expulsion of Satan and his follower Angels from Heaven’. Apart from the narrative about Adam and Eve this poem also describes Satan’s rebellion and the building of his army against God in Hell along with his followers like Beelzebub, Mammon and the war between Heaven and Hell. This poem allegorically also ponders upon the issue of Free Will. These are the reasons in brief why we consider these pieces of literary works as some of the greatest examples of Epic literature in the world. English and Literature as an academic subject is often overlooked by students and thought to be an easy major. However English Literature Homework is often laborious in nature and requires critical thinking and understanding of the English Literature text. Our English tutors can help you with your doubts regarding the English and Literature Homework help, study notes for fictions, novels, literary works and cultural and philosophical understandings of Poetry. 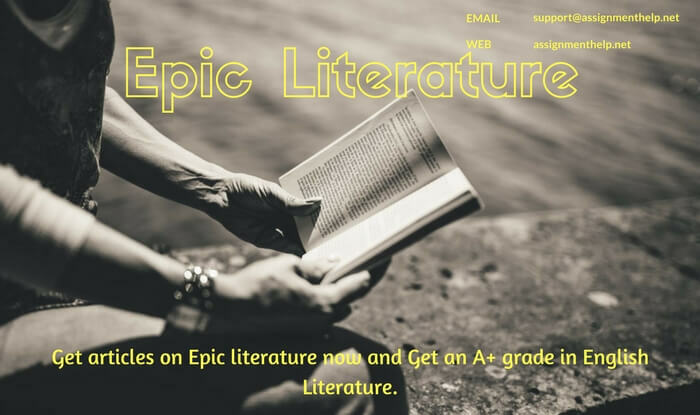 Order Epic Literature Homework Help and articles on Epic literature now and get an A+ grade in English Literature.